Promar Floating Telescopic Gaffs - Constructed of solid-steel, these gaffs can be stowed away at nearly half their full lengths, making them ideal for kayak anglers, float tubers, and boaters concerned with storage. Designed with floating EVA foam grip handles. The gaff hook is constructed of high grade stainless steel and sharpened to perfection. Includes safety gaff hook cover. Promar Grande - One of the most popular landing nets! These premium nets are outfitted with heavyweight black poly netting. Features include retractable anodized light weight aluminum handles, heavy duty construction, and double-pin yoke for superior strength and stability. 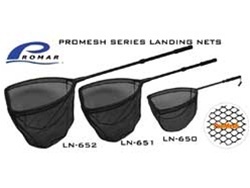 Promar Promesh Hook Resistant - The ProMesh Hook Resistant Landing Nets are a perfect combination of a snag-free, light weight, and Catch & Release style net. This exclusive new mesh material is as durable as regular nylon mesh, yet does not snag hooks or weigh as much as a rubber net. All models feature heavy-duty anodized aluminum telescopic handles. Models LN-651 and LN-652 have break-away aluminum frames for easier stowing. Trophy Collapsible Nets - When the type of fishing you do demands a large durable net, yet storage space is an issue, the Trophy Series Collapsible Landing Nets are the perfect solution. These space saving landing nets are perfect for small boats, canoes, and kayaks.